The First floor Theatre at La MaMa ETC. "A Quarreling Pair" by Australia's Aphids, presented by La MaMa E.T.C., New York. 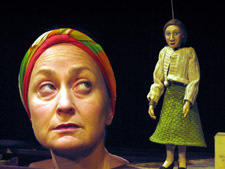 Caroline Lee and puppet. Photo by Zita Bradley. The unique bond between sisters is like no other. Some siblings are close, others are distant; some quarrel, others make up, but their connection is never neutral. 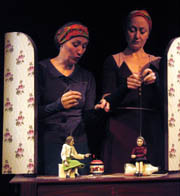 Watching Australia's Aphids theater perform a triptych of miniature puppet plays about sisters got me to thinking once again about the complexity and fragility of this exceptional relationship. In just 45 minutes, "A quarreling Pair," presented recently at La Mama as part of the La MaMa ETC. puppet series, successfully illuminated the many intricacies of sibling ties more than many a full length play. Composed of Jane Bowles 1945 short puppet play "A Quarreling Pair," Lally Katz's "Mr Peterson's Milk," and Cynthia Troup's "And When They Were Good," the evening offered audiences a unique chance to revisit the distinctive worlds inhabited by pairs of sisters. On a single multi-purpose set composed of a wooden dressing table, with a low bench next to it, a rug and a few cosmetics on the table, master performers and puppeteers Caroline Lee and Sarah Kriegler, take us on a fascinating journey from the claustrophobic quarters where Jane Bowles' two sisters live out their lives afraid to venture out into the world, through the intricate, noisy workings of Mr. Peterson's brain and on to a final fantasia played out in and around the dressing table. L: Sarah Kriegler, R: Caroline Lee. Photo by Jonathan Slaff. The evening opens on two gray-haired sisters in the form of small puppets, one in Bordeaux tunic and black skirt, the other wearing a long sleeved white knitted top and green quilted skirt. One sits on top of a jar of face cream, the other on a bottle of makeup remover, "lait démaquillant" (milk being a motif in both Bowles and Katz's plays). They seem poised to snap at each other. Theirs is not a friendly relationship. "I hope you are beginning to think about our milk," says the one. "Well I'm not," says the other, in a disgusted tone. One seems content with her lot and happy with her living arrangements, the other is disgusted with the world and has a tendency to have visitations from "our" dead, as she puts it. When one brings in the milk, the other knocks it off the table and leaves. One has a big heart, the other a small one, and so forth. Why do they stay together? What prevents them from leaving each other? Bowles' answer seems to be it is because they are sisters caught up in mutual dependence, unable to move on with their lives. The sisters argue about where to have a refreshing glass of milk. Photo by Zita Bradley. Because the sisters in Bowles play are incapable of moving beyond their separate rooms, director Margaret Cameron appropriately confines the two puppets to the top of the dresser and allows them to move only a short distance between each other. If it weren't for the live actors manipulating the few small gestures these puppets make - a raised arm, a hand swiped across the cup of milk - the two aging siblings would be condemned, like Beckett's characters, to remain immobilized forever. One is struck by how completely dependent they are on the live performers operating their strings and giving them a voice. Cameron achieves the perfect metaphor for Bowles vision of sisters unable to make up their minds to leave each other; they choose to remain co-dependent. In contrast, the adventurous sisters in "Mr Peterson's Milk" are eager to move beyond the cramped quarters of their earlier counterparts even if it is only in their imaginations. The flowered wallpaper on the sides of the dressing table top is replaced by colorful maps of roads tracing the paths they will take as they set off on a hobby horse to explore the milkman's brain. Buildings appear out of the tops of drawers; towers made of orange and yellow sticks engulfed in smoke rise up along with loud noises and the voice of the Dalai Lama. These reminders of the monuments of our decaying society are inevitable; but mostly the sisters have a wonderful time, it seems, including a trip to the bank in the form of a large clay pig floating around in the air and drawers flying open. What a different world these two sisters enjoy in comparison with Bowles' sorry duo. Standing: Sarah Kriegler, Reclining: Caroline Lee. Photo by Zita Bradley. In the third panel of the triptych "And When They Were Good," the two sisters do not live together; they only visit from time to time. Yet it is as if they were not truly separate as they continue to live in each others' minds and memories. The dressing table is now covered with objects: nail polish, a tape measure, a large glove, witch hazel, hair tonic, and sundry cosmetics. The top becomes three mirrors in which the sisters must play out and face inescapable reflections of their past and present. One of the puppeteers flaps open the pages of a book, spilling out the powder of dusty recollections. A doll with white flowing hair and dressed in a gossamer white gown appears in a nest of branches hanging over the dresser. She is an angel, perhaps, who seems to want to prune back the branches of their family tree to reexamine those memories of when the sisters " were good they were very very good and when they were bad, they were horrid." Looking at themselves in the mirror, they question their present appearance. Are we ugly? do we look like our mother? are we the image of our father? Accompanied by a soundscape of crackling, sinister noises, visions of unpleasant past experiences are played out. A sister with a frog in her mouth appears to frighten her sibling into submission; the other, old and missing her front teeth, comes through the mirror to snip off locks of her sister's hair. Fortunately, author Cynthia Troup does not dwell on the horrid. 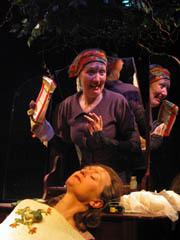 In the final moments of her play, the sisters reunite in a tender scene as the puppeteers gently lean one of them on the other's shoulder and place her head softly against her sister's neck where she remains as her sister speaks briefly of impending death. It is an unforgettable reminder that despite past quarrels and present miscommunications, an inescapable bond between sisters is forged from birth, and it will remain until the end. Beautifully written, masterfully performed, and skillfully staged, Australia's Aphids production "A Quarreling Pair" was a most welcome addition to La MaMa's Fall season.